The classic romantic candlelight dinner can never go out of style. So whatever might be the occasion, be it a proposal date or your anniversary, there is surely nothing more romantic than taking your beloved to a restaurant, which not only offers great food but also an amourous ambience. Dubai is a city where you would find several restaurants that are perfect for a romantic rendezvous. If you are holidaying in Dubai or are new to the city, here is a list of some of the best restaurant for a romantic private dinner in Dubai. Perched on a wooden pier, overlooking the Arabian Gulf, the Pierchic surely looks like a dream. 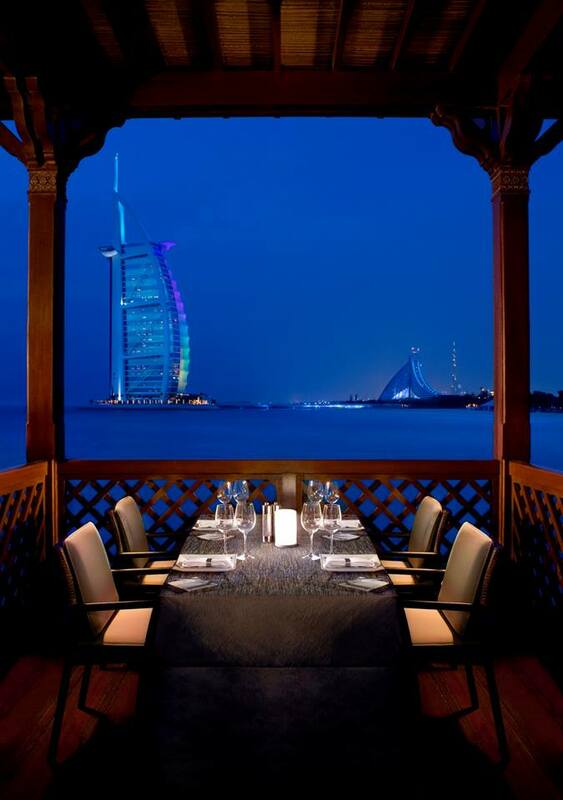 The restaurant which is located in front of the Madinat Jumeirah Complex is classy and offers an incredible view. This is also the place where you can get the best view of the Burj Al Arab. You would be able to feel the romance in the air right from the time you walk hand-in-hand on the wooden bridge towards the restaurant. When it comes to food, Pierchic has a Modern European seafood menu and serves the best oysters, salmon and prawns dishes in the city. Do not forget to order one of the delicious desserts which you can devour while enjoying the gorgeous view of the sea. However, make sure to book in advance as Pierchic is really popular and getting a table at the last minute can prove difficult. Watching the Dubai Fountain show with your partner is considered to be one of the most romantic things to do in Dubai. What if you could watch this marvellous show in the most comfortable way? Presenting to you Thiptara, a Thai restaurant (part of the Palace Downtown Hotel) located next to the Dubai Fountains. However, you do not have to visit the place just for the view or the beautiful interiors of the restaurant. On the other hand, Thiptara offers unique Thai dishes where the Royal Thai cuisine is integrated with Bangkok style cooking, thus tantalizing your taste buds. 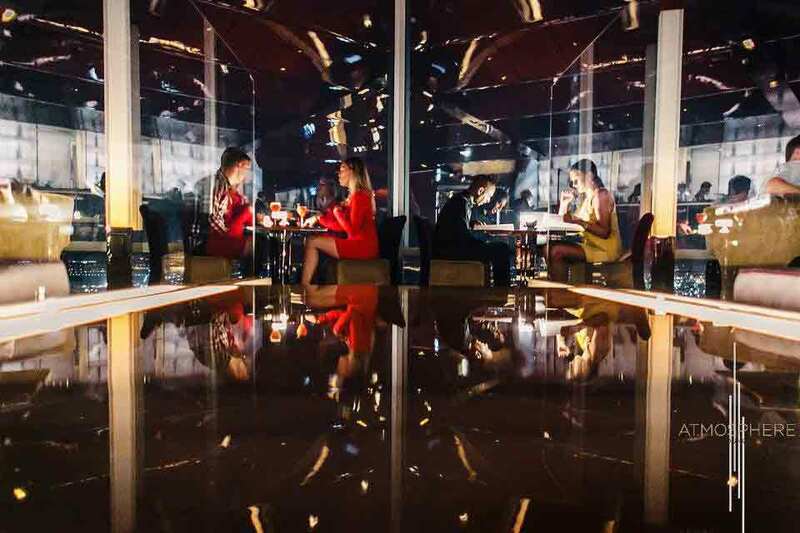 While the starters and main courses are a riot of flavours and textures, the dessert is drool-worthy and something you should not miss at any cost, at this candle light restaurant in Dubai. If you are looking for affordable romantic restaurants in Dubai, nothing can beat the dhow cruise in Dubai, both in ambience and budget. 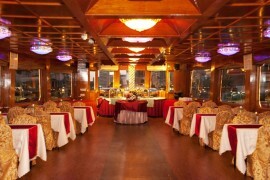 The dhow cruise happens on a traditional dhow which has been turned into a restaurant. You can go on a dhow cruise both on Dubai Creek and Dubai Marina, both places offering some incredible views of the city. 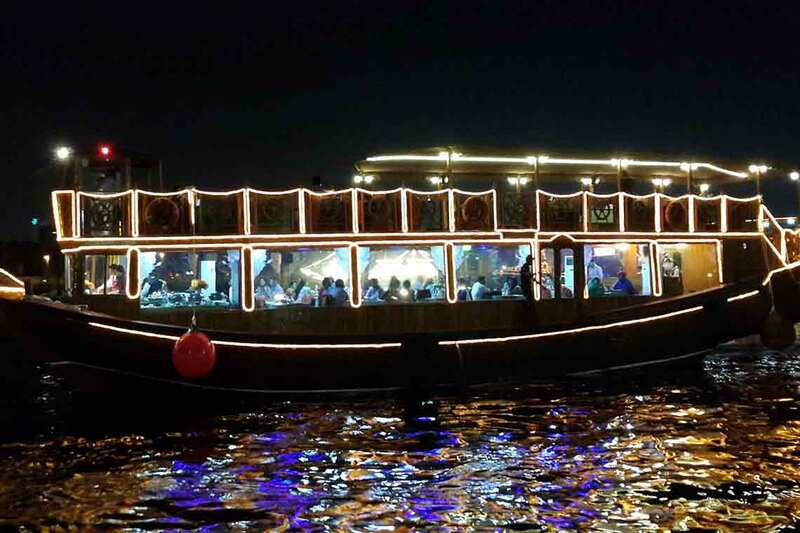 Lasting for over 2 hours, the dhow cruise gives you the chance to indulge in an internationa buffet and enjoy Arabic music and a live Tanoura dance performance. Always opt for a table on the upper deck of the dhow where apart from the uninterrupted views you can also enjoy a gentle breeze. What can be more romantic than this? The view of the ocean while having dinner with your partner is undoubdetly romantic. But what if you would be able to enjoy the view of the underwater world on your romantic date night? Sounds interesting? 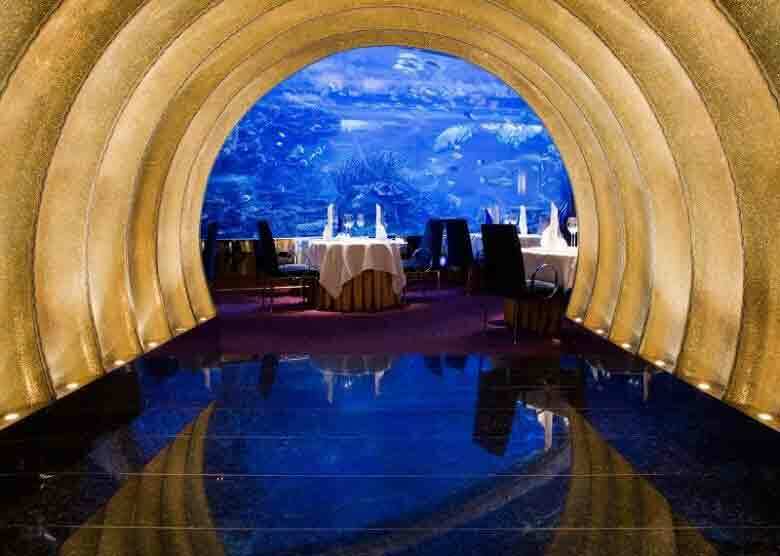 Head to Burj Al Arab’s Al Mahara, a restaurant built inside an aquarium. Couples looking for a romantic dinner can opt for a private room with their very own private aquarium, complete with a table decorated with rose petals and a lit candle. Menu includes a six-course dinner with some of the choicest seafood dishes by Nathan Outlaw, a European seafood specialist. Apart from the gourmet spread, dining at the Al Mahara includes bouquet of flowers for the lady, Hermes products for the couple and a delicious romantic dinner cake. Plus, if you are planning to propose to your beloved, why not get a diver to present the message from the aquarium? Wouldn’t it be the most romantic proposal ever? Going on a first date? Want to impress the lady? You cannot go wrong with Segreto! A cozy and elegant restaurant on Madinat Jumeirah, Segreto is one of the best Italian restaurants in Dubai. Complete with a candlelit stairway, the beautiful Madinat waters and a rooftop terrace that offers a gorgeous view, Segreto has everything to make your date evening the most romantic as well as the most memorable. After enjoying a few drinks at the rooftop terrace of the restaurant, head to your table located within stylish interiors. But great interiors is not the only thing you would enjoy here. Everything on the menu, from the pasta to the risotto, is to die-for. A candlelight dinner date at Segreto is the best if you are looking forward to no-frills, intimate date. Imagine a vast desert with a bonfire and your lady love for company. Romantic, wouldn’t that be? 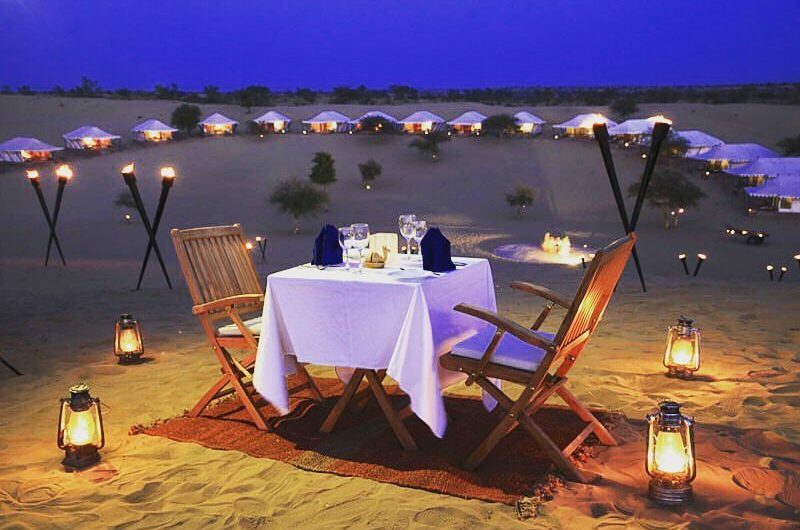 If you want to escape the crowd and commercialization of the city and spend some quality time with your partner, opt for a luxury dinner at the desert. With just a few staff members at your service, this is the perfect place to spend time with your partner without being disturbed. The private dinner date in the desert involves arriving in a luxury car, watching a bautiful sunset and enjoying a delicious meal right in the middle of the desert. There are several tour companies that offer private desert dinners for couples. Do your research and choose the one that offers value for money. If having dinner in the clouds is your definition for romance, there is no better place than At.Mosphere in Dubai. Located on the 122nd floor of the Burj Khalifa, At.Mosphere is said to be the highest restaurant in the world. So, while the ambience, interiors and food of this restaurant are great, the view is out-of-this world. The menu includes a combination of traditional and fusion cuisine, giving you the chance to indulge in a gourmet experience like no other. While you cannot go wrong with neither the starters nor the main course, it is the dessert which would blow your mind. An important thing to remember is that you need to make your booking well in advance (a week or even a month before) for a table at this restaurant. So, if a special occasion is coming up, do not waste any more time and pamper your beloved with a dinner at the tallest restaurant on earth. 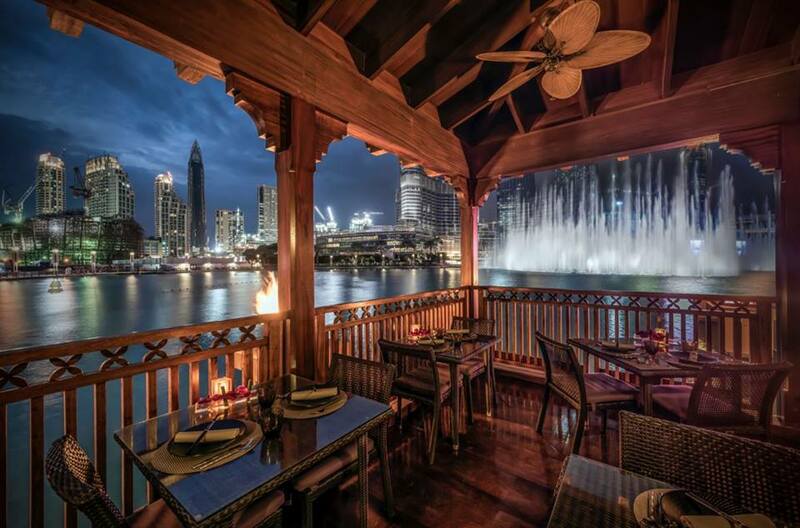 While these are some of the best romantic restaurants in Dubai, these are not the only ones. There are numerous others which offer an amazing ambience along with the most delicious food. So, what are you waiting for? Explore these restaurants with your partner and fire up the romance in your life! Hello Fellow Travellers, I am Shivam Khandelwal. I suffer from a beautiful condition called wanderlust. I love travelling and exploring new places. I believe life is too short and the world is too big. So, we have to get out as much as possible. I also love writing and want to share my honest, unbiased experiences with you. So, follow me, and I promise to open up new worlds, and experiences for you. Keep wandering!